Fandango made a visit to the set of Summit Entertainment's Now You See Me 2 in London back in December 2014 and they did share an exclusive (first!) behind the scenes photo of the cast. 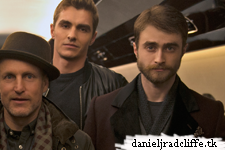 Now You See Me 2 features returning cast members Mark Ruffalo, Jesse Eisenberg, Woody Harrelson, Dave Franco, Michael Caine plus newcomer Lizzy Caplanand and ofcourse Daniel.